Although this is not a space I normally use to talk about my music activities, I’m really happy to share with you people something I’m deeply passionate about: gear for musicians. I started to play music in 1999, and since then I’ve chatted about music with countless people, including—obviously—many non musicians. If there’s one thing they don’t fully realise, it’s how sophisticated it can get when a guitar player puts together the necessary equipment to create their own sound. This article goes in that direction, and focuses on what’s probably the most puzzling component of it all: the pedalboard. If you’ve ever watched guitar players doing their thing on TV or on YouTube, you know they almost always have this sort of board in front of them, on the ground. It has buttons, or pedals, that they can press with their feet. That’s what it’s called a “pedalboard”. 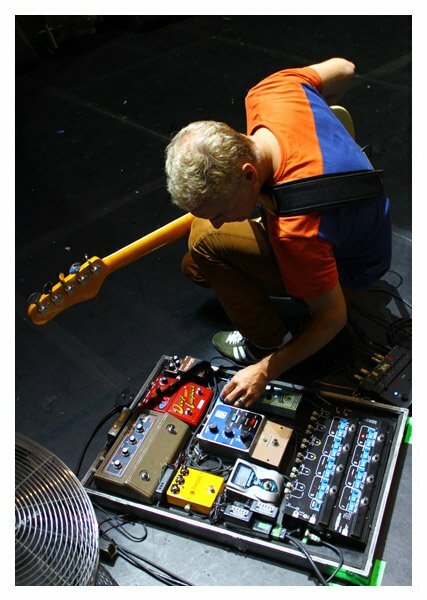 Paul Turner working on his pedalboard. Paul Turner is Jamiroquai’s bass player. 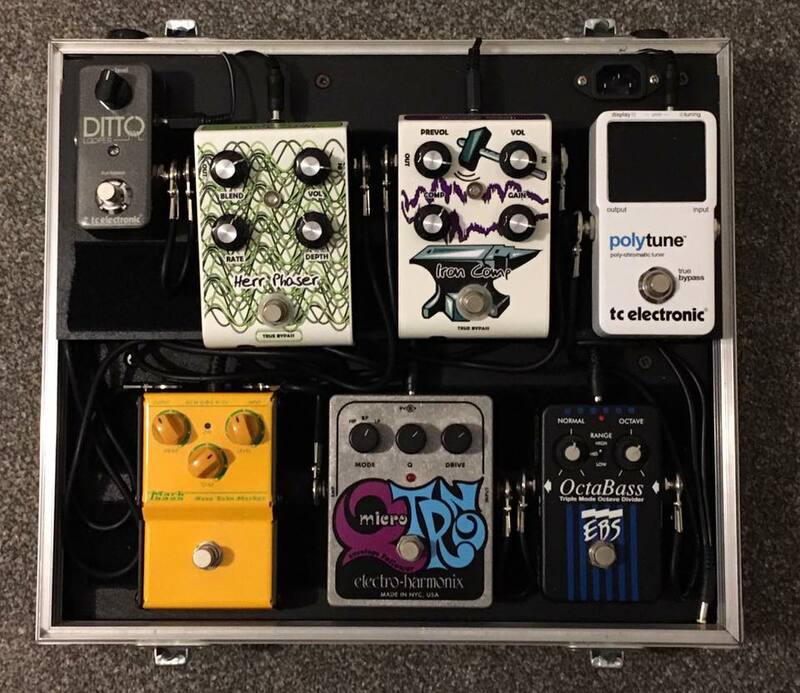 Typically, it might be a digital pedalboard, with all the effects that can be easily selected and combined, or an analogue pedalboard, with different pedals connected in a series; it can also have footswitches for other parts of their gear, but I’m not going to dig into that. When you hear your favourite guitar player doing their solo, what you hear is a combination of several elements: from the way they touch the strings to the pickups (magnetic transducers, usually sitting on the body of the guitar, that capture string vibrations and convert them to an electric signal), the amplifier, et cetera. Everything, literally everything in the path from the musician’s creative mind to the listener’s ears contributes to a guitar’s tone. Even the cables? Oh yeah. Between the guitar and the amp (or the preamp and the power amp, but let’s not get too much into the technicalities), there are devices that are meant to shape the sound, each in their own way. 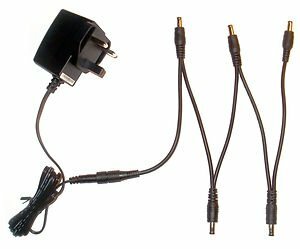 These devices are generally pedals / pedalboards or rack units. There are several types of effects, from those that amplify, produce tone, add noise (i.e. overdrives, compressors, wah, etc. ), to those that modulate (phasers, choruses, flangers) or add ambiance (delay, reverb, etc.). I won’t go deeper than this on single effects, as there’s too much to say. If you search one of these words on YouTube you’ll find enough pedal tests, reviews and samples to keep you busy for a couple of lifetimes. No kidding. Digital pedalboards don’t come with a so much positive reputation. They kind of force you into the possibilities that they offer, without too much room for improvements, as opposed to the endless shades you can get from different pedals that do one thing and one thing well. Also they are known to sound kind of plastic-y. Anyway, I haven’t tried one in a while so I shouldn’t really indulge further into comments that might probably be easily disputed. Boss GT-6. A digital pedalboard. I’m not entirely against digital pedalboards—in fact, I used to have a very cheap one I gave away along with a bass I sold. That pedalboard helped me find the effects I really like, the effects I want to use, and the effects I’m not interested in. Analogue pedals are awesome, and are the backbone of so many players’ tones, whether amateur or pro. They are usually cheap—you can get some at $30 or so, but those are not really good. The standard ones (from brands such as Boss, Aguilar, TC Electronic, Electro Harmonix, etc.) are in the $100-200 range. Janek Gwizdala pedal collection behind him. Let’s say you need an envelope filter, a funky auto-wah pedal that became popular during the ’70s. Here’s a good example of how to use it. You can try many envelope filters until you find the one you really like. Sounds expensive? Think again: you can buy second hand pedals, experiment with them, and re-sell them at pretty much the same price. You can exchange them with friends. You can build your own pedals. There’s no limit to the fun! Once you find pedals you actually like, they’ll probably end up in your pedalboards forever and establish the foundation of your tone. From this moment on, I will only refer to pedalboards assembled with analogue pedals. Most pedals can be powered by a 9V battery, but I never recommend it—I’d never trust batteries in the middle of a live show! Investing in a good power supply is a must. Janek Gwizdala in his vlog episode on how to build a pedalboard shows us he uses the MXR DC Brick, which looks cool and has enough power outputs for a medium sized pedalboard. Daisy chains can help too, in case you need more pedals than your power supply allows in terms of outputs. If you’re good at building stuff, by all means, you can transform chunks of wood and aluminium into a beautiful pedalboard. If you’re not, you can either buy a pre-made one (i.e. 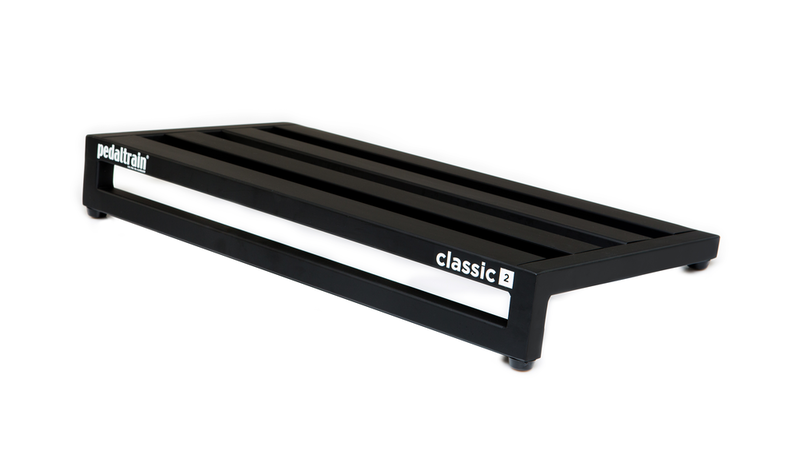 a Pedaltrain, which seems to be the standard these days), or have it built for you. If you have it built, remember that it’ll probably serve your needs in a specific phase of your music journey, so don’t spend a stupid amount of money. At some point you’ll want a smaller or bigger pedalboard. There’s no such thing as the permanent pedalboard. There’s just a fact of every guitar player’s life. There are rules (or, better, “guidelines”) for lining your pedals up. Some pedal types simply work better before / after other pedal types. Roland summarises those guidelines brilliantly: first, anything that amplifies or adds noise (i.e. overdrive/distortion effects, compressors, and wah pedals) goes at the beginning. Second, you want to create your basic sound first, then tweak it with some kind of modifying effect. This means that overdrives go before modulation effects (i.e. phaser, flanger, chorus). Finish the board with delay, reverb, and/or a loop station. Nothing said so far is mandatory—you’re free to explore different combinations. You’re not supposed to have this or that pedal: a pedalboard with no modulation effect, no delay, or no distortion is perfectly fine. The keyword here is experiment. Find your sound. Use what you like and what serves your music. When musicians put together their pedalboard, they usually end up creating something that reflects themselves and their personality. I can see so much of myself into the pedalboard I’m currently using. I’m a minimalist, and my pedalboard is, I think, the right pedalboard for a minimalist person. I like how I put together a series of pedals where there’s no double (you know how many guitar players I know have three different overdrives…) nor lack—each group of pedals is fairly represented, with no redundancy at all. Reliable tuner, the first one to be polyphonic—you can tune all of your guitar strings at the same time. Essentially, you strum your guitar strings and it tells you which string needs to be tightened or loosened. It also exists as a smartphone app, using the phone’s microphone to get the signal. Octaver from the Swedish brand EBS. 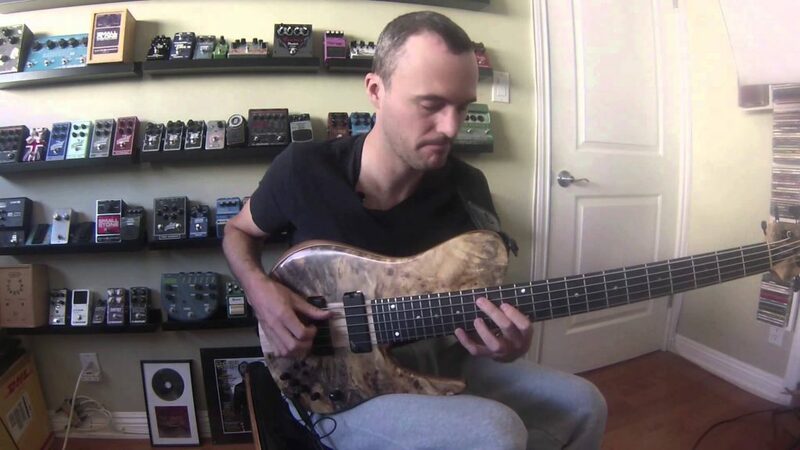 The octaver produces a note that is an octave lower than the actual note you’re playing, and plays it together with the real note, making the tone a lot fattier and deeper, if that makes sense. I love octavers, but I’m not really a fan of this particular model, and I’ve been telling myself for a while that I should replace with something better. But, as a matter of fact, it’s been sitting on my pedalboard for more than 5 years now. The tracking is not exactly precise, meaning that sometimes the note it produces stops before the natural note, but the tone is amazing. My little funk machine! Exceptional envelope filter / auto-wah, great with both grooves and melodies, that combined with the OctaBass produces a powerful acid sound. This is a compressor pedal developed by an Italian brand called Jad&Frèer. I’ve never really wanted a compressor, but it was a kind of forced choice when I got the Q-Tron. As the Q-Tron doesn’t have a volume control, sometimes it gets a bit exuberant—it gives spikes that never make sound engineers happy. The Iron Comp after the envelope filter makes sure everything stays on decent levels. The folks at Jad&Frèer didn’t build a traditional compressor. It lacks the threshold knob, which is replaced by the prevol control—the gain, plain and simple. The higher the prevol, the earlier the pedal starts compressing. The comp knob is what is usually known as ratio (determines how heavy the compression has to be). The gain knob is really a make-up gain, and here’s where things start being really interesting. The make-up gain makes sure that, if you lose some dB’s with the compression, you get them back by raising the overall volume. If you set a low compression, but go wild with the make-up gain, you’re actually turning the compressor into a booster. Simple overdrive produced by Markbass, the most famous Italian brand for bass amps & effects. It comes with drive, tone and level controls. You can’t go wrong with them. Fun fact: Markbass has a parallel brand for guitars called DV Mark, and DV Mark has a pedal called “Guitar Tube Marker” which has the same specs as the BTM. I’ve never tried it, but I’m pretty sure it sounds just like the BTM. Another pedal from Jad&Frèer. I’ve chosen this one as I’ve never really been happy with traditional phasers (i.e. the MXR Phase 90). They’re always thought for guitar players, and as a result low frequencies get lost. Herr Phaser respects low frequencies. The real gem of this pedal is the bi-colour led, that works also when the pedal is switched off and flashes according to the phase rate. That’s pretty handy during a live performance. It’s a plug-and-play looper from TC Electronic, super small, with only one knob (loop level). I love it and it quickly became the pedal I use more frequently in my studio. I really hate the power input on the right side though (as opposed to the upper side), which makes it sit in that awkward position in my pedalboard layout. The board itself has been built by a guy from Rome, who did an excellent job. It has two levels, and the power supply is elegantly hidden under the upper level. I hope it hasn’t gotten too technical at the end. If you have any questions, whether you are a pro player or you’re just curious about how this all works, don’t hesitate to ask in the comment section!